Whether you’re commuting, running errands, or just having fun, the GS is the perfect all around E-Bike. Lightweight, agile, and stowable, the GS is perfect for the city dweller looking for a light and agile pedal assist bike that’s easy to carry up to the office. 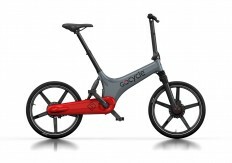 With a range of up to 40 miles, and plenty of power to get you up the hills, the Gocycle GS delivers.